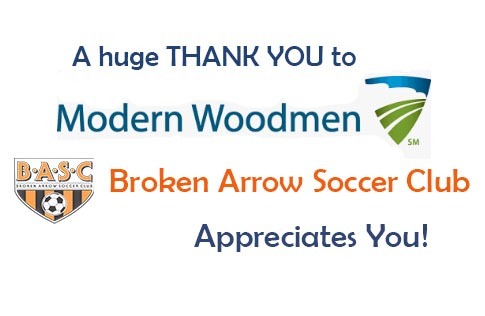 Broken Arrow Soccer Club is extremely honored that Modern Woodmen of America has chosen our club for their spectacular matching fund donation this year! As a 501c3, non-profit youth organization, donations allow our club to be able to assist members by way of purchasing items that are not ordinarily in our budget. 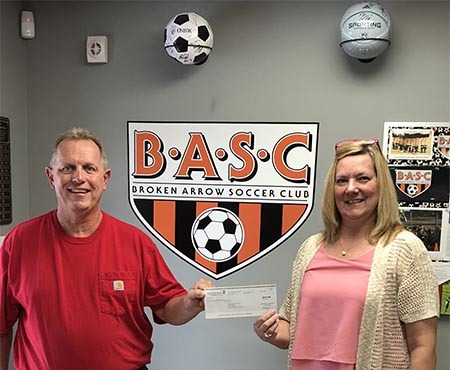 BASC will be utilizing the funds, which Modern Woodman of America has so generously given, to purchase computer equipment for the Broken Arrow Soccer Club headquarters building. The headquarters building houses our volunteer staff and referees during the busy times of our soccer seasons each year. The new computer equipment will give our volunteer staff and referees the ability to facilitate the needs of our membership each week for league games, special events and tournaments. A note about Modern Woodmen of America, this organization was founded in 1883, Modern Woodmen supports members, families and communities throughout the United States. Thank you again, Modern Woodmen of America, for your generosity to Broken Arrow Soccer Club, it is so appreciated!